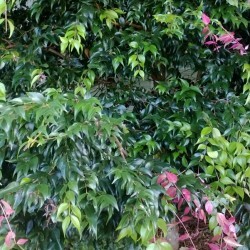 A large evergreen tree with small glossy dark green leaves that are pale pink then red when young bearing clusters of small creamy white flowers mostly in Summer, followed by red edible fruit. Growth Size: Generally 15m h x 7m w but can be larger in big open spaces. Temperament: Coastal tolerant, frost intolerant. Perfect for: Screening, Hedging, shade tree.